Kathryn Jasper' history research class. The phrase “geographic information system” (GIS) generally makes students think of…well…maps. Yet the computer system that captures and analyzes data also helps transform layers of information into an understandable, visual pattern. 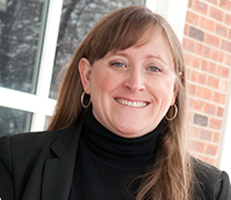 For Professor of History Kathryn Jasper, GIS enabled her students to seize a moment in time. With the help of a College of Arts and Sciences Interdisciplinary Grant, Jasper teamed up with Professor of Geography John Kostelnick to get students the basics of GIS. “I like to say I made a cameo appearance in this class,” he said. Kostelnick and his geography teaching assistants led small workshops for the class to introduce GIS, which can use everything from landscape patterns and photography to digital data and cartography to build a complex picture. “In geography, we teach whole undergraduate courses in GIS, but these students were able to pick up an amazing amount,” he said. 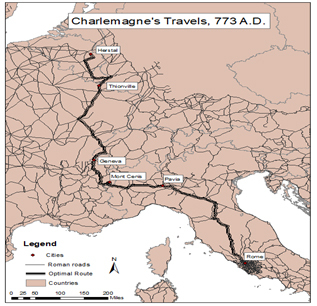 Student Brooklyn Scharwark used GIS to create her poster on Charlemagne’s movements and infrastructure projects. 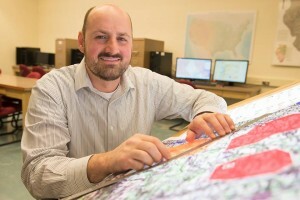 The CAS grant enabled Jasper to purchase a computer dedicated to GIS for history students. “And we were very appreciative of the fact that John let us use the computers in a geography lab,” she added. The two plan to continue their work together with future courses. “One of the great benefits of having John on this project was for students to see scholars from different disciplines working together to solve things.” Jasper said she hopes other areas take a similar path integrating GIS into courses. 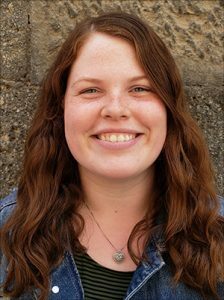 “It would be great to have a digital methods course in various disciplines,” she said. Collaboration is a University core value, stated in Educate Connect Elevate: Illinois State—The Strategic Plan for Illinois’ First Public University 2018-2023.